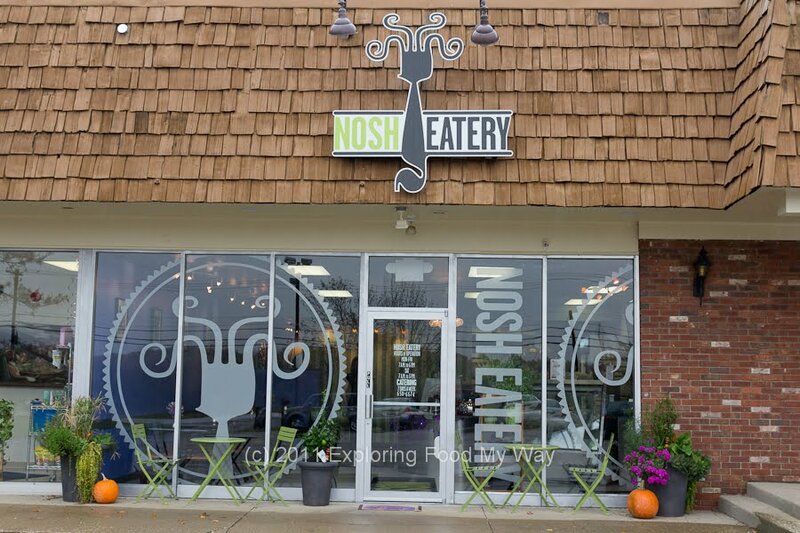 I first learned of Nosh Eatery & Creative Catering many months ago from my longtime friend and partner in the Veggie-Vegan Project, Paul. 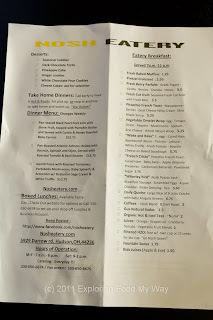 We had been discussing potential restaurants to include in the project and Paul had heard that Nosh was to have a fairly good vegetarian and/or vegan selection. He also knew that they would be based out of Hudson, but unfortunately, that was the extent of his knowledge. Fast forward to Labor Day at the beginning of September and I found myself at the annual Taste of Hudson again. Per usual, I made my cursory walkaround of the entire event before deciding which booths I would visit. Wouldn't you know it? 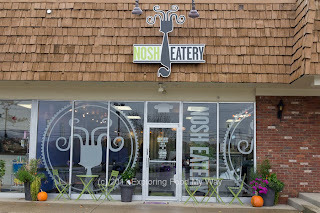 Nosh was one of the booths. 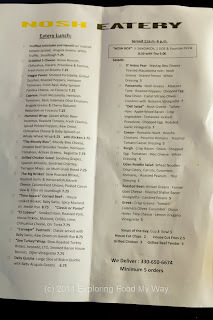 Based on the strength of the food at the Taste of Hudson, I finally got around to stopping in for a bite to eat at their actual location. Their storefront was south of downtown Hudson quite a bit and located at 5929 Darrow Road, Hudson, OH 44236. They can be reached at 330-650-6674 and they have the usual trio of a website, Facebook page, and Twitter account so that you can keep track of them. 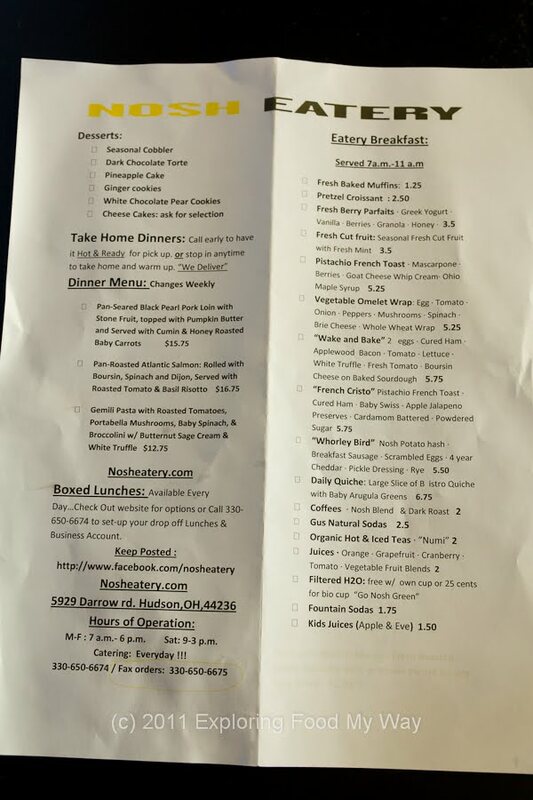 In addition to the options on the menu, daily specials had also been chalked onto a board hanging above the coffee machine on the back wall. The soup was piping hot, had just a bit of texture to it, and had a deep tomato flavor. The soup had been pureed, but not completely as there were still small bits of tomato to be found within. The garlic and basil flavors complemented the soup nicely. In lieu of crackers, the soup had come with a small grilled flatbread quarter that had been seasoned with salt, herbs, and of all things, caraway seeds. It was inventive and delicious and if there was anything to complain about for this dish, it was that the dish only came with one of the "crackers." Filled with luscious expertly grilled cuts of beef shoulder, caramelized onions and peppers, sauteed Chanterelle, fresh thyme, and Havarti and Gruyere cheeses, this was a sandwich with which to be reckoned. The roll (part of a baguette from Great Lakes Baking Company just up the street) was split, buttered, and then grilled to not only give it texture, but also prevent the roll from "sogging out," a dilemma many other sandwich places have yet to solve. From my first bite to my last, I enjoyed this sandwich immensely. It was hot, melty, chewy, earthy, beefy, and savory. If someone had said, "make a Philly-style inspired sandwich but elevate it," this would be the result. 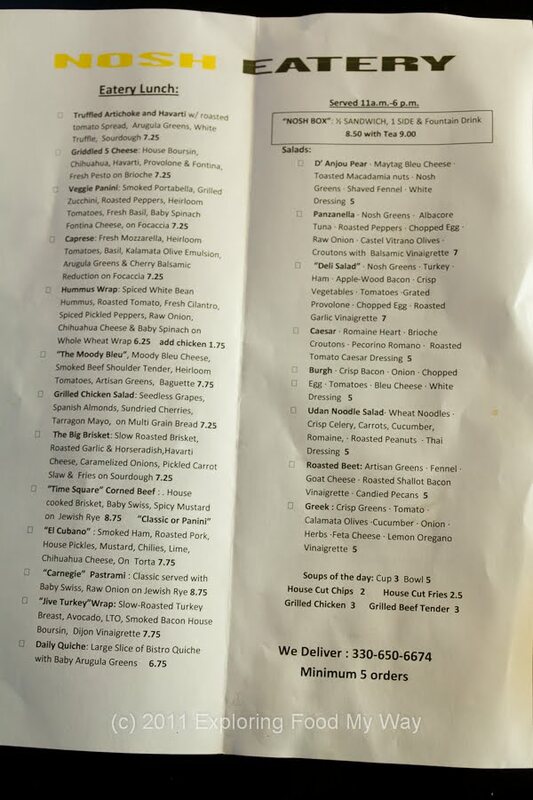 The only criticism I might levy would be that the portion size seemed a little small for $7.75. Rewarmed and plated, the cobbler was accompanied by fresh chevre-infused whipped cream and a small scoup of buerre noisette ice cream. The plate was finished with some powdered sugar and small streaks of raspberry coulis. I remember the whipped cream from the Taste of Hudson and while you could taste the goat cheese flavor in that version, today's whipped cream was a bit lacking. The brown butter ice cream, however, was heavenly. The cobbler itself was infused with lots of strawberries and if the cobbler topping had been a bit more cake-like in consistency, it would have reminded me more of a clafoutis than a cobbler. Overall, I found the cobbler to be just borderline on the sweet side -- a cup of black coffee or an espresso would have cut the sweetness to the perfect amount. 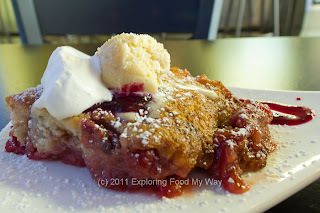 That being said, I finished the entire portion and would have no qualms ordering -- or recommending -- this dessert again. My meal at its inevitable conclusion, my server brought me the check and before tip, it came to $16. 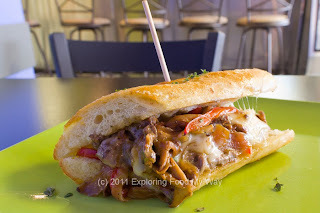 While I did question the value of the cheesesteak sandwich, everything I had eaten today at Nosh was fresh, hot, and quite frankly, delicious. As was made evident on the daily specials board, today marked the fifty-fifth day of operation. I'd suggest you give them a visit soon so that they can add many more numbers to that ticker. 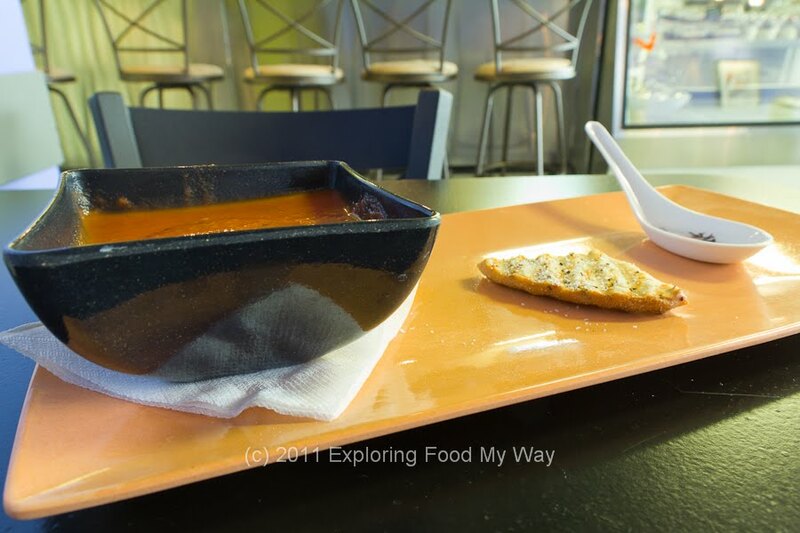 Want to promote a food-related event here on Exploring Food My Way? E-mail me. This weblog and all of its contents are copyrighted 2015. All rights are reserved. Headbanger's Kitchen Keto Cheesy Pork Fried "Rice"
Indian Food (Indian food from India, not North American Native Americans) Have You Tried It Yet? can i get all these at one job: more guidance, more responsibility, more learning & more money? To Renew, or Not to Renew? I caught you a delicious bass.